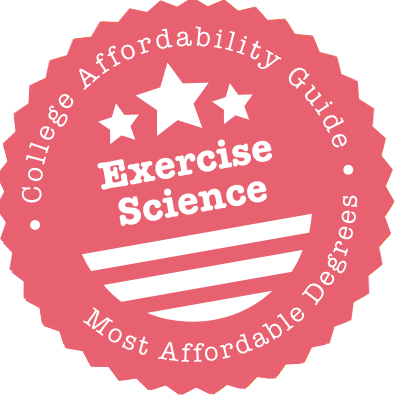 Scroll down to see the most affordable exercise science degrees, as well as info on the different types of exercise science degrees and exercise science program accreditation. UMD's Department of Health, Physical Education and Recreation offers a Bachelor of Applied Science (BAS) in Exercise Science program. Students can choose Health and Fitness or Exercise and Sport Science as their area of concentration. The department also lets students choose a concentration that fits their special interests and career goals. Depending on their area of concentration, students complete either an internship or a research project as their capstone requirement. Students conduct research and collect data using resources such as the Exercise Physiology Laboratory, the Biometrics Laboratory and the Motor Learning and Vision Laboratory. Graduates are eligible to sit for certification examinations including the National Strength and Conditioning Association (NSCA) and the American College of Sports Medicine (ACSM). The Department of Health and Kinesiology at Texas A & M University offers the following Bachelor of Science programs in exercise science: applied exercise physiology, basic exercise physiology, and motor behavior. The applied exercise physiology program prepares students for entry-level careers in a variety of allied health and medical fields. It also provides the educational background for professional programs such as nursing, physician's assistant, or occupational therapy. The basic exercise physiology program prepares students for graduate studies in exercise science or for entry into medical or dental schools. The motor behavior program places an emphasis on the physiology and psychology of human movement. Students who complete the program are prepared for further studies in the motor neuroscience field. UNC's Department of Exercise and Sport Science offers Bachelor of Arts (BA) degrees in the following: Athletic Training, Sport Administration, Exercise and Sport Science, and Fitness Professional. The Exercise and Sport Science program provides students with the skills and academic background necessary to pursue a variety of career opportunities in the health-related fields. There is also a Master of Arts (MA) in Exercise Physiology program available. Graduate students can apply for teaching assistantships, which typically includes in-state or out-of-state tuition waiver, health insurance, and a stipend ($11,400). Exercise Physiology graduate students are usually awarded teaching assistantships during both their first and second years of study through the Lifetime Fitness program. Students admitted to the Bachelor of Science (BS) in Kinesiology program offered by UIC's Department of Kinesiology and Nutrition can choose either the Movement Science concentration or the Exercise Science and Health Promotion concentration. The latter prepares students for graduate studies and careers in a number of health-related fields including medicine, occupational therapy, physical therapy, personal training and many others. The Master of Science (MS) in Kinesiology program has two areas of concentration: Applied Exercise Physiology and Motor Control and Biomechanics. The department also offers a Doctor of Philosophy (PhD) in Kinesiology and Nutrition. This doctoral program is recognized by NAK, the National Academy of Kinesiology. The Department of Health and Exercise Science at Appalachian State offers a Bachelor of Science in Exercise Science program that allows students to select a concentration in clinical exercise physiology, pre-professional, or strength and conditioning. All exercise science majors must take 32 credits in core classes, including classes in human anatomy, exercise physiology, and biometrics. They also earn at least 30 credits in their area of concentration. Pre-professional majors are expected to work a practicum as a capstone project, and students majoring in clinical exercise physiology must work an internship. Departmental scholarships include the Eric DeGroat Memorial Athletic Training and Exercise Science Scholarship (amount varies). The Department of Kinesiology at St. Cloud State University has five undergraduate majors, two minors, and a master's program. Depending upon their career goals, undergrads can major in athletic training or health and physical education, or minor in athletic coaching. Community health and recreation and sports management are other available bachelor's degrees. At the graduate level, students can earn a Master of Science in Sports Management. Students in these majors can join clubs such as the Sports Management Club or Student Athletic Trainers Association, which organize speakers and events. Students in several of these programs are eligible for internships. The department awards scholarships such as the Brainard Memorial Scholarship in Physical Education. Michigan Technological University's Kinesiology and Integrative Physiology Department provides a Bachelor of Science program in exercise science and a Master of Science program in kinesiology. Based on American College of Sports Medicine (ACSM) standards, the BS in Exercise Science provides students with a foundation of knowledge in motor behavior, biomechanics of human movement, exercise physiology, and exercise psychology. Students in the program can also earn a coaching endorsement certificate or minor in coaching while they earn their degree, and students who complete an internship are eligible to receive ACSM Health Fitness Specialist certification. The MS in Kinesiology includes a thesis and non-thesis track of study. Twenty scholarships greet students at the Department of Kinesiology, where WIU's Exercise Science programs are housed. Undergrads choose between bachelor's degrees in Athletic Training, Exercise Science and PE. And even though WIU is not close to the sea, it has a scuba diving minor to go along with a coaching minor. While there is no graduate program in Exercise Science, the MS in Kinesiology awards qualified students with paid assistantships to become coaches and trainers for the university's sports teams. Those graduates can also compete with Sport Management students for the nine teaching assistantships the department awards each semester. Winona State University offers a Bachelor of Science in Exercise Science degree that meets the requirements of the Commission on Accreditation of Allied Health Education Programs (CAAHEP). Students who complete the program are eligible to sit for the American College of Sports Medicine (ACSM) exam for certification as health fitness specialist and/or the National Strength & Conditioning Association (NSCA) exam for certification as a strength and conditioning specialist. Students learn how to design and administer comprehensive health and fitness programs for a variety of clients, as well as how to assess and implement health and wellness programs. There are a number of specialization areas available, such as strength training, personal training, nutrition, and strength and conditioning with athletes. Undergraduates who major in exercise science at Castleton University can choose from three areas of specialization: strength and conditioning, clinical exercise physiology, and research. Strength and conditioning students prepare for the Certified Strength and Conditioning Specialist credential, and clinical exercise physiology students prepare for certifications from the American College of Sports Medicine. Such nationally recognized credentials will help students start their career. All exercise science students are encouraged to take part in internships and research projects. Students have access to a range of specialized research facilities, including an applied physiology lab, metabolic measuring systems, and electrocardiography units. The Department of Kinesiology at Bethel College offers a Bachelor of Science in Exercise Science degree. Courses for the major cover a wide range of topics including human anatomy and physiology, applied nutrition, psychosocial dimension of kinesiology, and exercise training techniques and programming. Exercise science majors who are in a pre-professional program (such as pre-medicine) are encouraged to take the recommended electives for pre-professional programs that include the following: general biology, general chemistry, biochemistry, general physics (I & II), life span development, and abnormal psychology. Students have access to a state-of-the-art human performance laboratory with modern scientific equipment, as well as an athletic complex with two gymnasiums and weight and training rooms. All beginning students are automatically considered for financial assistance. Iowa State University's Kinesiology Department offers an undergraduate major in kinesiology and health with a concentration in exercise science. The Exercise Science program prepares students for roles as exercise specialists in health clubs, corporations, hospitals, sports medicine clinics or cardiac rehabilitation centers by teaching them about the physiology of exercise, physical fitness and conditioning, exercise leadership and exercise psychology. Students in the program are also required to complete a minimum 320-hour internship that lasts at least 10 weeks. Additionally, the Department offers Master of Science and PhD degrees in Kinesiology with emphases in exercise physiology and exercise psychology, among other options. Exercise science students are eligible for several departmental scholarships, including the $1,000 Germaine G. Guiot Scholarship and the $1,000 Barbara E. Forker Scholarship. The College of Health Sciences and Human Services at Midwestern State University grants bachelor's and master's degrees in exercise physiology. The bachelor's program requires 35 credits within the major plus required courses in biology, chemistry, physics, and psychology. The 30-credit master's has a thesis and non-thesis option. A 19-credit minor in cycling performance is also available. The Department of Kinesiology offers bachelor's degrees in sport and leisure. Sport and leisure studies majors take 37 credits within the major and are required to complete a minor in one of four fields, including business administration, criminal justice, or mass communications. Students who want to minor in kinesiology can choose an emphasis in general kinesiology, coaching, or recreation and fitness. The College of Applied Health Sciences at the University of Illinois at Urbana-Champaign offers a Bachelor of Science in Kinesiology degree. The curriculum includes a comprehensive list of courses such as the social science of human movement, motor development, growth, and form, bioenergetics of movement, and kinesiology and community health. Qualified upper division kinesiology students can apply for the 5-year BS/MPH (Master of Public Health) joint degree program. Students who plan to pursue careers in teaching are required to apply to the Teacher Certificate program by the end of their sophomore year. Master of Science and Doctor of Philosophy degrees are available in the following areas of specialization: biobehavioral kinesiology, cultural, pedagogical, & interpretive kinesiology, and exercise physiology. The University of Iowa offers a BA in Health and Human Physiology with a track in Exercise Science. Students must apply for departmental scholarships by March 1st. At the graduate level, the MS in Health and Human Physiology features a sub-track in Clinical Exercise Physiology. The program tries to place new students in half-time appointments as teaching assistants and returning students in either teaching or research assistant roles. All come with free tuition and health and dental benefits. The Department of Health, Nutrition and Exercise Sciences at North Dakota State University has programs in exercise science from the bachelor's level to Ph.D. Undergrads majoring in exercise science are required to take several field experience courses and complete a semester-long internship before graduation. At the graduate level, the department has master's programs in exercise/nutrition science, leadership in physical education and sport, and advanced athletic training. NDSU also grants a Ph.D. in Exercise Science and Nutrition. Applicants for any of the graduate programs must have a bachelor's degree in a related field with a 3.0 GPA. Graduate students can apply for a research or teaching assistantship, which pays a stipend and includes a full tuition waiver. Michigan State University's Department of Kinesiology offers Bachelor of Science, Master of Science and PhD programs in kinesiology. The BS in Kinesiology is available in 13 areas of emphasis, including several exercise science emphases and emphases in orthotics and prosthetics, nutrition for physical activity and communication. BS students who choose an emphasis in exercise science must also complete a minimum three-credit internship, which requires 60 hours of work for each credit earned. The MS in Kinesiology is offered in eight concentrations, and the PhD in Kinesiology is offered in four concentrations, with both programs offering concentrations in exercise physiology. Several scholarships are available to kinesiology students, including the Thomas W. Smith Endowed Scholarship in Kinesiology and the Henry J. and Betty Montoye Endowed Scholarship. Queens College has both a bachelor's and master's program in nutrition and exercise sciences. Students who earn the Bachelor of Science in Nutrition and Exercise Sciences receive instruction in both disciplines. The program requires 36 departmental credits along with courses in statistics, biology, and chemistry. Students who complete the B.S. degree are prepared for jobs with employers such as cardiac rehabilitation centers, preventive health agencies, community and senior citizen fitness programs, sports medicine programs, and corporate wellness centers. The Master of Science in Nutrition and Exercise Sciences is open only to applicants who have a strong background in chemistry, biology, nutrition, and exercise science. Master's candidates may concentrate in nutrition, exercise sciences, or in the combined disciplines. The University of North Carolina - Greensboro Department of Kinesiology offers a Bachelor of Science degree. Students can choose between the concentrations of Physical Education and Health Teacher Education, Sports Medicine, and Fitness Leadership. The department also offers a Master of Science in Kinesiology with a concentration on Sport & Exercise Psychology, Community Youth Sport Development, Pedagogical Kinesiology, Motor Behavior, Exercise Physiology, Sociohistorical Studies, Sports Medicine, and Applied Neuromechanics as well as a Master of Science in Athletic Training. Additionally, they offer a Doctorate of Education in Kinesiology entirely online as well as a Doctor of Philosophy in Kinesiology. There are scholarships available specifically to both undergraduate and graduate students within the Department of Kinesiology. Towson University's Department of Kinesiology offers an undergraduate major in exercise science, as well as a master's degree in kinesiology for certified teachers. The Bachelor of Science in Exercise Science provides students with in-depth knowledge in biomechanics, exercise physiology and biochemistry, growth and development, exercise nutrition, measurement and evaluation, and exercise psychology. After graduating, students can apply for professional certification through the American College of Sports Medicine or the National Strength and Conditioning Association. The Master of Science in Kinesiology is designed for PK-12 teachers and is offered primarily online. MS students are required to meet face-to-face one to two times per semester. Graduate students in the Kinesiology Department are eligible for a limited number of graduate and research assistantships. The Health and Exercise Sciences (HES) Department at Truman State University offers a Bachelor of Science in Exercise Science with an applied/clinical concentration, a physical health and education concentration and a pre-medical sciences concentration. Students in the applied/clinical concentration study subjects such as biomechanics, exercise physiology, strength and conditioning, personal training, sport and recreation management, cardiac and pulmonary rehabilitation. The physical health and education concentration prepares students to teach physical education and health in K-12 schools, while the pre-medical sciences concentration covers subjects like pre-chiropractic studies, pre-physical therapy studies, pre-medicine studies and pre-physician assistant studies. Exercise science students are eligible for several scholarship opportunities, including the Larry W. and Linda K. Boleach Scholarship, the Jack and Melba Bowen Scholarship and the Jennifer C. Boyce Memorial Scholarship. UNO's School of Health, Physical Education and Recreation is part of the College of Education and offers a Bachelor of Science in Education (BSE) degree with a major in Physical Education. Students who enroll in this program can choose Exercise Science as their area of concentration. This a non-teaching degree designed to prepare students to take the certification exam administered by the American College of Sports Medicine (ACSM). There are five areas of emphasis available: Biomechanics, Exercise Physiology, Motor Development/Control, Strength Conditioning, and Sport and Exercise Psychology. The school offers Master of Science (MS) and Master of Arts (MA) in Exercise Science programs, each with a thesis or non-thesis option. The Kinesiology Department at SUNY Cortland offers Bachelor of Science (BS) degrees in the following: Athletic Training, Coaching, Exercise Science, Fitness Development, and Sport Studies. Students in the Exercise Science program pursue two primary areas of inquiry - sports performance and health-related aspects of physical activity. The department also offers a Master of Science (MS) in Exercise Science program. Students can choose to specialize in one of four exercise science sub-disciplines: Biomechanics, Exercise Physiology, Motor Behavior, and Sport and Exercise Psychology. SUNY Cortland's Kinesiology Department is a member of the American Kinesiology Association (AKA). The Department of Health and Physical Education at Dickenson State University offers a Bachelor of Science in Exercise Science degree that provides students with the opportunity to pursue a non-teaching career in the field. In order to graduate from the program, students must satisfactorily complete the following courses: performance sport assessment and athletic development (I & II), teaching weight training, biomechanics, physiology of exercise, and advanced exercise science. Through classroom instruction and hands-on training, exercise science majors learn how to design and implement exercise and mobility programs for diverse populations and age groups. Students have access to the Ben C. Frank Human Performance Center, where they learn advanced training techniques and methods to enhance human performance using the Athletic Republic Acceleration Program. The College of Health Sciences at Texas Woman's University offers a Bachelor of Science (BS) in Kinesiology program that allows students to choose an Exercise Science Track. The college also offers Master of Science (MS) and Doctor of Philosophy (PhD) programs in Exercise Physiology. Students admitted to the MS program can choose a thesis or non-thesis track. The non-thesis option requires students to complete an internship program in a clinical or wellness setting. Undergraduate Kinesiology students can apply for a number of scholarships including the following: Roberta "Bobbie" Peters Scholarship, Anne Schley Duggan Endowed Scholarship, and the Margaret Varner Bloss Scholarship. Graduate Teaching Assistantships are given primarily to doctoral students, but students pursuing MS programs may also be considered. Through its School of Health, Physical Education and Leisure Services, the University of Northern Iowa offers a Bachelor of Arts in Movement and Exercise Science, as well as a Master of Arts in Physical Education with a focus in exercise science. The B.A. in Movement and Exercise Science requires 39 credits of major courses, including 12 credits in the exercise science emphasis. The M.A. in Physical Education offers an emphasis in kinesiology and an exercise science focus within the kinesiology emphasis. The program requires 30 credits of coursework and can be completed in thesis and non-thesis versions. Graduate students are eligible for graduate assistantships with salaries of approximately $4,920 per semester. At UGA, the College of Education is home to the Department of Kinesiology. The department offers a Bachelor of Science in Education (BSED) degree with a concentration in Exercise and Sport Science. There are also Master of Science (MS) in Kinesiology and Doctor of Philosophy (PhD) in Kinesiology programs that are available. Students admitted to these programs can choose Exercise Physiology as their area of specialization. UGA's PhD in Kinesiology program is recognized by the National Academy of Kinesiology. The Clifford Gray Lewis Financial Assistance Award provides emergency funds to Kinesiology students who need help in order to continue in the program. Academically outstanding undergraduate and graduate Kinesiology students can apply for the Mary Ella Lunday Soule Scholarship Awards ($1,000). University of Idaho's Department of Movement Sciences offers a BS in Physical Education with a concentration in exercise science, an MS in Movement and Leisure Science with an emphasis in exercise science and health and a PhD in Exercise Science. The exercise science bachelor's program is offered in three tracks of study: fitness, health and human performance; pre-athletic training; and pre-physical therapy. The MS in Movement and Leisure Science with emphasis in exercise science is a 30-credit program with thesis and non-thesis tracks of study. Students are required to complete a culminating experience which can include a written comprehensive exam, an internship or a thesis. Scholarships offered through the Department of Movement Sciences include the Bill and Diane Stoneman Scholarship and the Bonnie Hulstrand Scholarship. The Department of Kinesiology at Brooklyn College offers a Bachelor of Science in Exercise Science and a Master of Science in Exercise and Sport Science. The programs combine classroom instruction with hands-on experience in a laboratory setting, including a human performance lab. The B.S. program requires 73 credits, including 60 credits in kinesiology courses, as well as required classes in health and nutrition sciences, chemistry, and physics. The master's program offers two tracks: Sports Science or Exercise Science and Rehabilitation. Admission to the master's program is competitive, and accepted students typically have an educational background in a related field such as physical therapy or athletic training. Students must complete 36 credits of coursework to earn the M.S. The University of North Texas offers a Bachelor of Science in Kinesiology, the study of human movement. Graduates of this program often become fitness instructors, ergonomic consultants, allied health professionals, athletic trainers, personal trainers, physical education teachers, sports directors, and strength and conditioning specialists. Students in this program can focus their studies on all-level teacher certification, general kinesiology, health fitness, allied health pre-professional, and athletic training. Many students go on to pursue graduate school programs in sports psychology or exercise psychology. Peru State College offers Bachelor of Arts and Bachelor of Science degrees in health, physical education and recreation with a concentration in sport and exercise science. Students are required to complete 48 credits of major coursework, including 37 credits of health, physical education and recreation core courses. Core courses cover subjects like first aid, kinesiology, nutrition, physiology, motor learning and physical assessment. Students are also required to complete 11 credits of concentration courses in anatomy and physiology, as well as a three-credit internship. The sport and exercise science concentration does not lead to teaching certification and therefore does not require the education core required for other concentrations. Bemidji State University's Department of Human Performance, Sport and Health offers a Bachelor of Science in Exercise Science with concentrations in medical fitness, and fitness leadership and promotion. The medical fitness concentration is designed for students who want to continue their studies of exercise science or allied health at the graduate or professional level. The fitness leadership and promotion concentration is designed for students who want to work in the fields of fitness, wellness or personal training. Students in both concentrations complete 16 core courses in subjects like biology, human anatomy and physiology, first aid, CPR, motor development, sport psychology, athletic training and fitness assessment. Students in both concentrations are also required to complete an internship. The Department of Kinesiology at the University of Wisconsin-Eau Claire offers bachelor's degrees in athletic training and kinesiology. Students in the kinesiology program may focus on human performance (fitness management, health promotion, pre-professional, or sport performance), physical education teaching, movement studies, or sport pedagogy. The department provides the community, region, and nation with services such as camps, clinics and workshops, children's movement education classes, intergenerational adult fitness classes, and athletic training services. Students in the kinesiology program will take such courses as Anatomical Kinesiology, Biomechanical Kinesiology, Motor Learning & Development, and Exercise Physiology. The School of Physical Education and Tourism Management at Indiana University Purdue offers a Bachelor of Science in Kinesiology degree with an emphasis in exercise science. The program includes additional optional courses for students who plan to continue to professional school after graduation. Pre-professional courses are currently available for pre-physical therapy, pre-occupational therapy, pre-medicine, and pre-physician assistant students. There is also a Master of Science in Kinesiology degree available with a track in clinical exercise science. Students are required to take courses such as the role of exercise in health and disease, physiological neuromuscular control of human movement, and interpretation of data in human performance. Qualified graduate students receive research/teaching assistantships that cover tuition, and includes health insurance and a 10-month stipend. The Department of Exercise, Health and Sport Sciences at USM's College of Science, Technology and Health offers a Bachelor of Science (BS) in Exercise Science program with two areas of concentration: Exercise Physiology or Health Fitness. After completing the program, Exercise Science majors are eligible to sit for the following certification examinations: American College of Sports Medicine (ACSM), Health Fitness Specialist and Clinical Exercise Specialist, and the National Strength and Conditioning Association's (NSCA) Certified Strength and Conditioning Specialist. USM's Exercise Science program is accredited by the Commission on Accreditation of Allied Health Education Programs (CAAHEP). The Department of Exercise Science and Sport Studies at Rutgers University offers Bachelor of Science (BS) degrees in the following areas: Applied Kinesiology, Exercise Science, Exercise Physiology, and Sport Management. The Exercise Science program prepares students for careers or further studies in athletic training, exercise physiology, medicine, and physical and occupational therapy. The department also offers Master of Science (MS) and Doctor of Philosophy (PhD) programs in Kinesiology and Applied Physiology. Students admitted to these graduate programs at Rutgers complete a core curriculum in advanced exercise physiology, exercise testing and prescription fundamentals, research methodology, and statistics. Students can then build on these core courses and create a program of study that supports their interests and goals. Students enrolled in the Department of Kinesiology at the University of Texas at Arlington can earn a Bachelor of Science in Exercise Science, a Bachelor of Arts in Kinesiology and Master of Science in Exercise Science. The BS in Exercise Science is the Department's largest program and is offered in two tracks of study: a clinical health professions track and a fitness/wellness track. Students working toward the BA in Kinesiology can also choose from two tracks of study: a track for students looking to become physical education teachers and a generalist track with an optional emphasis in sports. Scholarships available to kinesiology students include the $300 Judd Ramsey Memorial Scholarship and the $250 Hugh and Anne Simmons Scholarship. The Department of Health, Athletic Training, Recreation & Kinesiology at Longwood University offers a bachelor's degree in exercise science. This program provides students with a comprehensive understanding of exercise metabolism, fitness and health maintenance, nutrition, exercise training, cardiovascular risk identification, and rehabilitation. Graduates pursue employment or graduate degrees in the fields of physiology, biomedical sciences, and exercise science. Students will take such courses as Advanced Strength and Conditioning and Applied Exercise Physiology. Exercise science majors will gain experience by participating in a 400-hour, 8-credit course internship, which will provide students with professional experience in the industry. The Department of Kinesiology at California State University-San Marcos offers a Bachelor of Science in Kinesiology as well as a Master of Science in Kinesiology. There are three focuses in the B.S. degree: health science, pre-physical therapy, and applied exercise science. Students who pursue this degree will graduate with a comprehensive understanding of the principles of kinesiology and the way to apply kinesiology-related skills to real-world issues. Students will take such courses as Introduction to Physical Education and Kinesiology, Techniques and Analysis of Fitness and Weight Training, Care and Prevention of Athletic Injuries, and Adapted Physical Education. The Department of Kinesiology and Health Education at Southern Illinois University Edwardsville offers a Bachelor of Science in Exercise Science and Master of Science degrees in exercise physiology, and exercise and sport psychology. The BS in Exercise Science includes coursework in basic science and exercise science, as well as an internship. The Department also offers an Accelerated Exercise Science program that can be completed in three years. The Master of Science in Kinesiology with a concentration in exercise physiology is an adult evening program that is offered in a thesis and non-thesis track of study. Scholarships available to students studying exercise science and kinesiology include the Corporal Evan T. James Memorial Scholarship and the Outstanding Student in Exercise Science Scholarship. The School of Exercise and Nutritional Sciences at SDSU's College of Health and Human Services offers two Bachelor of Science degrees - BS in Athletic Training and BS in Kinesiology. The athletic training program is accredited by the Commission on Accreditation of Athletic Training Education (CAATE). Graduates of the program are eligible to take the Board of Certification athletic training exam. The BS in Kinesiology program offers three emphasis areas: pre-physical therapy, fitness specialist, and exercise generalist. On the graduate level, Master of Science degrees are available in applied movement science, exercise physiology, and in exercise physiology and nutritional science. Students can apply for the Mary Quam Hawkins Memorial Scholarship ($2,000) and the Pearl Kock & Margot Pollak Memorial Scholarship ($2,500). The University of South Florida's Department of Educational and Psychological Studies offers an undergraduate program in exercise science and a Master of Science in Exercise Science. The undergraduate program in exercise science is a two-year cohort program that students can begin their junior year. The MS in Exercise Science is 36-credit program offered in two concentrations: strength and conditioning, and health and wellness. Students can also choose from a thesis or non-thesis track of study. The Exercise Science program at the University of South Florida is endorsed by the American College of Sports Medicine. Scholarships available to exercise science students include the Linda Blume Endowed Scholarship and the Karen Jacobs Endowed Scholarship. Middle Tennessee State University offers a Bachelor of Science in Exercise Science, a Master of Science in Exercise Science, and a doctoral degree (Ph.D.) in Human Performance with a specialization in Exercise Science. Students who graduate with these degrees go on to become employee fitness directors, exercise physiologists, group exercise instructors, personal trainers, physical therapy technicians, and pulmonary rehabilitation specialists. The degree requires students to complete a 12-credit hour internship so that they may pursue a real-world experience that will help them when seeking employment. The Master's degree program has both thesis and non-thesis options, and the degree will prepare students for certification through the American College of Sports Medicine. Exercise science is an umbrella term covering everything from exercise physiology and kinesiology to biomechanics, sports nutrition, sport psychology, and fitness & wellness. Graduates of sports science programs often work as personal fitness trainers in gyms, fitness centers, hospitals, schools, and medical facilities. Or they find jobs as clinical exercise physiologists for professional sports teams and U.S. armed forces. Or they use their sports science degree as a stepping stone to becoming a doctor, athletic trainer, coach, or physical education teacher. If you’re fascinated by exercise and nutrition, and talented in the field of science, this may be the degree for you. However, we recognize you’re going to have a lot of a questions. Which degree do you need to become a personal trainer? Is a bachelor’s degree worth the investment or should you opt for an alternative major like athletic training? What kinds of certifications are important? For all the answers, check out our guide to affordable exercise science programs. You’ll find explanations of degree choices, sample coursework, and career options, info on accreditations, and the great NASM vs. ACSM debate. An associate’s degree in exercise science is a 2-year undergraduate program that focuses on general education requirements and core exercise science subjects (e.g. anatomy, biology, nutrition, etc.). Programs are offered at a variety of community and junior colleges. A high school diploma or GED is required to apply. Many professionals in the fitness industry have an associate’s degree. An associate of science (AS) is often the first step towards a bachelor’s degree. If you’re thinking of more education, make sure your associate course credits will be transferable to the 4-year program of your choice. Associate of Science (AS) in Exercise Science: A strong academic program usually taken by students who eventually plan to earn a bachelor of science. Associate of Applied Science (AAS) in Exercise Science: A skills-based program (i.e. an applied degree) intended for students who wish to start work in fitness training (or a related field) straight after graduation. Related majors for exercise science include exercise physiology, kinesiology, fitness & wellness, and movement science. You may also wish to consider related fields such as physical therapy or athletic training. Check to see what your preferred job requires. For example, a CAPTE-accredited associate degree in physical therapy assisting (PTA) will prepare you to take the national licensure examination and start work immediately. The curriculum for an associate’s degree in exercise science depends on your program. For example, in an AS, you might be required to combine general education credits (e.g. composition, communications, psychology, etc.) with a wide variety of relevant science courses (e.g. exercise physiology, personal training, human movement, nutrition, etc.). You may also be choose to electives such as sports injuries or emergency response. As a rule, the AAS tends to be more focused on technical skills and job training. That means, in addition to AS subjects, you may be required to complete a practicum in fitness training. Look for programs that give you hands-on experience in areas such as fitness assessment, exercise testing, and group instruction. Courses in business management will also prove useful. To buff their résumés even further, a lot of personal trainers with an AS or AAS choose to earn certification from an organization such as ACSM, NASM, or ACE. We talk more about these options in our certification section. A bachelor’s degree in exercise science is a rigorous 4-year undergraduate program that provides a core foundation of knowledge in areas such as kinesiology, exercise physiology, movement science, fitness, and wellness. Many students use this degree as a stepping stone to graduate work (e.g. public health, education, physiology, etc.) or advanced professional degrees (e.g. medicine, physical therapy, etc.). Programs are offered by a wide range of colleges and universities. A high school diploma or GED is required to apply. Bachelor of Science (BS) in Exercise Science: The most common degree for exercise science majors. The curriculum will include a healthy proportion of college-level science and math courses. Bachelor of Arts (BA) in Exercise Science: A much rarer offering. A BA may be more theoretical and less technical than a BS, but it’s always best to check the individual program for precise details. Related majors for exercise science include exercise physiology, kinesiology, fitness & wellness, and movement science. If you’re interested in working straight after graduation, you may wish to look at related degrees such as athletic training or physical therapy. For instance, with a bachelor’s degree in athletic training, you are eligible to take the ATC board of certification exam and practice as an athletic trainer (e.g. in a professional sports setting). Talk to your mentors and college adviser about your options. The curriculum for a bachelor’s in exercise science is often a combination of general education requirements (e.g. math, English, composition, etc.) and core science subjects. This “core” could include biology, anatomy, chemistry, exercise physiology, kinesiology, nutrition, biochemistry, biomechanics, and fitness. Depending on your major, you may be able to choose “tracks” or electives in a special area of interest (e.g. fitness training, pre-medicine, clinical exercise physiology, corporate wellness, etc.). To give you real-world training, many programs will arrange internships. You may also be expected to complete a capstone/research project in your final year. These jobs can be rare and fiercely fought over. A number of hospitals now require a master’s degree at minimum. Hours can be long and pay can be low. Even with a master’s degree, you may find it difficult to demand a good starting salary. Unlike athletic training or physical therapy, exercise physiology does not have a national recognized standard of practice. This means you may find it impossible to gain reimbursement from HMOs and insurance companies. A master’s degree in exercise science is a 1-3 graduate program that covers advanced studies in the research and application of movement science. You’ll find a variety of master’s programs (e.g. exercise physiology, exercise science, movement science, rehabilitation science, etc.) in a variety of universities. A bachelor’s degree in exercise science or a closely related field is required to apply. Master of Science (MS) in Exercise Science: A challenging program that involves high-level science courses, independent research, and in-depth training. Most programs give students the option to specialize in a concentration/track (e.g. public health, fitness & wellness, clinical exercise physiology, strength and conditioning, research, etc.). In your search for master’s programs, you may find schools that offer a thesis option and/or a professional option. The thesis option is generally intended for students who wish to pursue a PhD or doctorate. The curriculum for your master degree will depend on your choice of concentration/track. For example, if you are focused on sports training, you might be required to take courses in performance enhancement, injury prevention, exercise physiology, exercise endocrinology, athletic training, sports management, and motor control and rehabilitation. You could be working with – and studying – professional basketball players or growing kids. Some programs will also prepare you for certification exams (e.g. the ACSM exercise technologist qualification). If you’re thinking about becoming an exercise physiologist, be aware that physical and occupational therapists are almost guaranteed to earn more than you. Some experts argue that it’s best to think about the EP job as preparation for clinical graduate work in PT or OT. With a master’s degree, you also have the option to look at PhD programs or professional degrees (e.g. sports medicine). A Doctor of Philosophy (PhD) in Exercise Science is a 3-7 year degree focused on original research and applied science. It is the highest academic qualification you can achieve. Each PhD program is unique, but many are based on either physiology or kinesiology. Some universities offered combined master’s/doctorate programs. Other schools will expect you to hold a master’s degree before applying. The first few years of a PhD program are intended to prepare you for the rigors of conducting your own research project. That means you may find yourself taking courses in statistics, research methods, and applied science. You may also be required to pass an exam to show your mastery of these subjects. After that, you will have more freedom to pursue independent research. The final product of a PhD is a dissertation – a book-long summary of your research findings and conclusions. Many students pursue a PhD in order to become researchers or university professors. Others attain it in order to qualify for high-level administrative jobs (e.g. chief administrator of a hospital’s fitness & wellness department). However, if you’re interested in working as a licensed physical therapist or a doctor, you will need to pursue a professional doctoral degree specifically in that area. A certificate in exercise is a non-degree academic qualification that takes ~6 months-1 year to complete. Like a minor in a conventional degree program, certificates are intended to provide students with specific skills. For example, a health professional might wish to earn an exercise science certificate in order to develop programs for individuals with medical or other significant limitations. If you are thinking of pursuing a certificate in order to earn course credits for an academic degree, first make sure that your certificate credits will be transferable to the program of your choice. Some schools have developed certificate programs (e.g. in fitness training) that are explicitly intended to prepare you for professional certification. Always double-check that your school’s program is recognized by the certification body. Undergraduate Certificate: Targeted at aspiring undergraduates who are considering a bachelor’s in exercise science or current undergraduates who wish to prepare for graduate study, gain experience, and/or explore specific areas. Graduate Certificate: Targeted at baccalaureate holders who are interested in acquiring new skills, earning course credits for a master’s degree, and/or advancing their job prospects. On the whole, we suggest that you look for schools with regional accreditation. This is a “seal of approval” granted to institutions (e.g. non-profit and public colleges and universities) by one of six regional accrediting bodies (e.g. Western Association of Schools and Colleges). Regional accreditation only applies to a college or university, not to an individual exercise science degree or program. For further quality assurance, have a look at our list of program accreditations below. In your search for exercise programs, you’re likely to run into the acronyms CAAHEP and CoAES. These are father and son – the Committee on Accreditation for the Exercise Sciences (CoAES) works under the auspices of the Commission on Accreditation of Allied Health Education Programs (CAAHEP) to establish standards for academic programs in personal fitness training, exercise science, and clinical/applied exercise physiology. But it is only the CAAHEP who actually accredits the program in exercise science or a related field (e.g. physical education, kinesiology, etc.). In fact, CAAHEP accredits 2,200 programs+ in 20 health science disciplines. CAAHEP is regarded as a strong accreditation – there are only 30-40 undergraduate programs in exercise science in the U.S. that have it. The Commission on Accreditation of Athletic Training Education (CAATE) is the national accrediting body for athletic training degrees. In short, if you want to sit for the BOC exam and become a Certified Athletic Trainer (ATC), you must attend a CAATE-accredited education program. Professional Programs for students who wish to sit for the Board of Certification exam and become a BOC-certified athletic trainer. These programs could be offered at the bachelor’s level or post-baccalaureate level. Post-Professional Degree Programs (e.g. Master’s or Doctorate) for students who are already BOC-certified athletic trainers and wish to improve their knowledge and skills through didactic, clinical, and research experiences. Post-Professional Residency Programs that build upon knowledge and experience athletic trainers have gained in professional, entry-level programs. If you’re considering a sports management degree, you may wish to look for programs that are accredited by the Commission on Sport Management Accreditation (COSMA). COSMA was established by the National Association for Sport and Physical Education (NASPE) and the North American Society for Sport Management (NASSM) in 2008, but its accreditation policies and standards are completely its own. It accredits sport management education programs at the baccalaureate and master’s levels. If you are interested in becoming a K-12 physical education or health education teacher, you have the option to look for a program that has been accredited by the Council for the Accreditation of Educator Preparation (CAEP). This organization is the result of a merger between 2 former education accrediting bodies – the NCATE and TEAC. We talk more about CAEP in our article on K-12 Teaching. Strong physical education and health education programs will also often state they follow national standards established by SHAPE America (formerly the American Alliance for Health, Physical Education, Recreation, and Dance). These standards provide a guide for the preparation and continuing education of teachers. If you’d like to teach in a K-12 public school, you must have a state teaching license. (Private schools may not require state licensure, but they’ll generally expect you to hold a degree.) We talk about the state licensure process and options for obtaining an education degree in our article on K-12 Education Degrees. Please be sure to check with your State Board of Education for exact details on licensure before you enroll in a PE or health education program. You want to make sure your state will recognize your degree. The American College of Sports Medicine (ACSM) offers a wide array of well-known certifications in health fitness (e.g. personal trainer – CPT), clinical exercise physiology (e.g. registered clinical exercise physiologist – RCEP), and specialty areas (e.g. cancer exercise trainer – CET). You’ll see a fair amount of debate about ACSM vs. NASM certification. Broadly speaking, ACSM is generally orientated towards clinical training and is the standard for medical and university fitness centers. Like ACSM, the National Association of Sports Medicine (NASM) offers a recognized certification in fitness training – the CPT. Once they have initial CPT certification, trainers can choose to specialize in a raft of specializations (e.g. fitness nutrition, youth exercise, weight loss, behavior change, etc.). CPT certification from NASM is often useful for trainers working with athletes and people of average fitness. The National Strength and Conditioning Association (NSCA) is a well-regarded organization that provides certifications in personal training (NSCA-CPT), strength and conditioning (CSCS), tactical strength and conditioning (TSAC-F), and working with special population clients (CSPS). A useful point about NSCA is that it publishes a scientific journal on strength training called the Journal of Strength and Conditioning Research. Fitness trainers who work with athletes at the college level may wish to look into this credential. The American Council on Exercise (ACE) is yet another body that offers fitness training certifications, including credentials for personal trainers, group fitness instructors, health coaches, and certified medical exercise specialists. There is always a lot of debate about ACSM vs. NASM vs. NSCA vs. ACE. In general, you may see more job openings asking for the first three, although employers are often willing to consider ACE holders with strong job experience.